Batting: DM Bess 49 off 95 balls, Joe Root 45 off 72 balls, DJ Malan 28 off 71 balls, JC Buttler 34 off 67 balls. After play resumed on the 2nd day of this test match, the English batsmen Joe Root and DM Bess started right from where they left off. The pair looked indestructible as they slowly but consistently began to build a steady partnership between them. 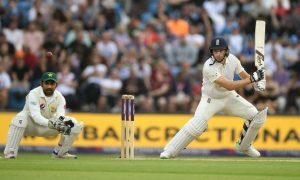 Pakistan needed a bowler to rattle the English batsman as neither Root nor Bess were looking in the mood to give away their wicket. 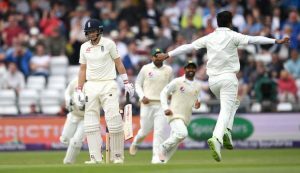 At this point Root was on 45* however, Pakistan knew that the English captain gets nervous as he nears his fifty and that is what they were eagerly waiting for. And that is exactly what Root did. As, he made the mistake of playing Amir’s full-length delivery outside off as the ball nicked off his bat and went straight to Sarfraz who was happy to pouch it. Dawid Malan now joined the Dominic Bess on the crease. This was the time when Sarfraz should have allowed Abbas and Amir to bowl in pairs in order to enforce pressure on the new batsman. Furthemore, Dawid Malan had always been prone to pace in swinging conditions so getting his wicket would have been easy if Sarfraz would have made this decision. But, his slight error in judgement allowed Malan to share a sizeable partnership with Bess. As, a 50-run stand between the two was up in no time. Both batsmen then held the Pakistani bowlers for some more time as it was now time for a tea break. Pakistan needed to get their plans right in the tea break and come back stronger or England would run away with the match. And, that is exactly what they did as Amir returned for his 1st over after tea and rattled Malan with extra bounce as the Englishman edged out to 1st slip. The English wicket-keeper Johnny Bairstow now joined the ever-green DM Bess on the crease. Bess was looking to make it big as he was nearing his fifty. But, he couldn’t get there as the Pakistani leg-spinner Shadab produced extra bounce off the pitch and Bess nicked the ball to first slip where Asad Shafiq took the catch. Jos Buttler now joined his Bairstow on the crease and England needed both of these batsmen to fire in order to secure a big lead over the visitors. Meanwhile, this was not the end of Shadab’s excellent bowling as he produced another chance for a wicket in his next over. But, Hasan Ali dropped the catch and Jos Buttler got a 2nd life. This was a key moment of this match as Buttler didn’t allow this chance to go to waste as he and Bairstow shared a 48-run partnership to put England in the lead. After that Bairstow started playing aggressively as he struck 2 consecutive fours off Faheem Ashraf bowling in the 80th over. But, this tactic of his cost him as on the very next ball he nicked a catch to Sarfraz and with that England had lost 6 wickets. Chris Woakes came to the crease and two overs later Pakistan had the option to take the new ball, which they did. However, it didn’t matter to England at all as both Woakes and Buttler were trying to score swiftly in order to score a lead of at least 150 over Pakistan. 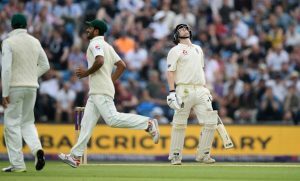 Pakistan needed a change of tactics at this point of time as they needed to clean up England’s tail if they wanted to have a chance in this game. 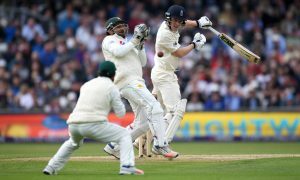 All hopes were now pinned on Mohammad Abbas and he delivered as he lured Woakes to play the ball on off-stump and the batsman nicked the ball to Sarfraz. Sam Curran was the new man in and at this point only five overs were left before the day would have come to a close. Pakistani bowlers weren’t bowling enough yorkers at this point and this allowed the English batsman to see off the Pakistanis for the day as Day 2 of Pakistan Vs England 2nd Test came to an end. It was England’s day as they lead by 128 runs with 3 wickets remaining. End of 2nd Test – Day 3 (Pakistan Vs England): That is it for today do join allsportspk tomorrow for the 2nd day of this exciting test between Pakistan Vs England.